THE PHYSICAL AND mental benefits of playing piano, or music of any kind, have long been recognized. The piano, in particular, has been an unparalleled outlet for those seeking escape, creative expression, and simply fun and joy. Recent years have only seen more evidence of the benefits of piano come to light, linking music making to a healthy body, a healthy mind, and a healthy life. Even though you’re sitting down, playing the piano is a workout all its own, and offers different physical and physiological advantages to players of all ages. For instance, regular piano playing sharpens fine motor skills and improves hand-eye coordination in the young and developing. Research has shown that piano lessons for older adults have a significant impact on increased levels of Human Growth Hormone, which slows the adverse effects of aging. Bringing music into your life is also proven to reduce anxiety, heart and respiratory rates, cardiac complications, and to lower blood pressure and increase immune response. Piano practice also boosts cognitive and intellectual abilities, which is to say it makes you smarter and activates similar parts of the brain used in spatial reasoning and math. Learning piano benefits memory and retention in amazing ways — particularly verbal memory — and helps build good habits like focus and perseverance, diligence and creativity. Children who had a few years of piano study under their belts could remember twenty percent more vocabulary words than their peers. And childhood musicians are better equipped later in life to retain information from speeches and lectures. Playing piano has been shown to increase spatial-temporal ability, which figures heavily in math, science and engineering. Regular music practice at an early age can even make structural changes to the brain that stay with you for the rest of your life, making your brain more efficient both while playing and in extra-musical endeavors. Playing the piano offers a plethora of health benefits that will supplement every part of your life. And that doesn’t even begin to consider the deep cultural network and historical tradition that you join as a piano player and owner. For two hundred years, the piano has been a staple of the home, bringing together families and friends and strengthening communities with the power of music. 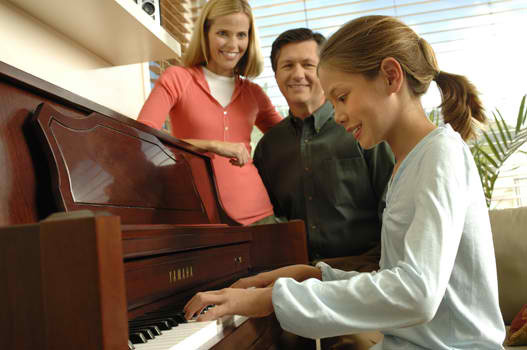 Bring a piano into your home today, and reap the benefits of playing piano for a lifetime. For help on deciding on what type of piano to choose, see our How to Choose a Piano page.